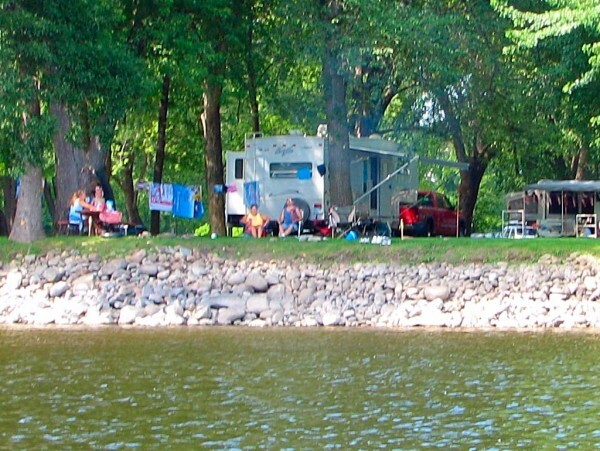 We've established the following campground guidelines to help ensure the safety and enjoyment of all our guests. One vehicle per campsite. All additional vehiccles and all trailers must be parked in the parking lot. Security gates are installed for your safety. There is a $20.00 cash deposit required for a gate card. Lending of gate cards or opening the gate for others is grounds for immediate eviction. All vehicles must be registered. All vehicles must register and display their car pass at all times. Quiet hours are 11 p.m. to 9 a.m. Quiet means surrounding campsites can not hear you. Turn radios and lights down and refrain from talking loudly. We ask that groups work together to control the noise within your group. Playgrounds close at dark. Our guests camping near the playgrounds appreciate your cooperation. Children and teens should be at their campsite or with a parent by 10:00 p.m.
No glass bottles, vehicles or pets allowed on the beach or swimming area. We try to make Two Rivers clean, presentable and safe. Please help us with those efforts on your own site. Please respect our campground and your fellow campers. Any campers who are disrespectful to others or cause a disturbance will be asked to leave without a refund. Please stay within the campground boundaries and off our neighbors property. Tresspassing laws are in effect - if you are not registered - you are trespassing. Time spent camping isnt' spent - it's invested!